Printer Willy Wood operated this old (ATF Chief) printing press from 1973-1980, when Vehicule Press did its own printing. Véhicule Press began in 1973 on the premises of Véhicule Art Inc., one of Canada's first artist-run galleries. The large space occupied by both the gallery and the press at 61 Ste-Catherine St. West was once the Café Montmarte--the renowned jazz club of the 1930s. (See Stepping Out: The Golden Age of Montreal Night Clubs.) 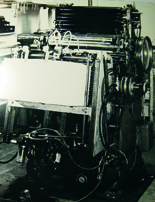 Guy Lavoie (designer of the Véhicule Press logo), Annie Nayer, Marshalore, and Vivian Jemelka-White began using equipment inherited from Kenny Hertz's defunct Ingluvin Publications and an idle, ancient ATF Chief 20 printing press originally purchased by artist Tom Dean to print Beaux-Arts magazine. In 1975 the press became Coopérative d'Imprimerie Véhicule--Quebec's only cooperatively-owned printing and publishing company. Véhicule Press was the publishing imprint of the coop. In late spring 1977, Véhicule Press moved to 1000 Clark Street in the heart of Chinatown, and in 1980 moved to an industrial space located on Ontario Street East. In spring 1981, the coop was dissolved and Simon Dardick (who had joined the press during the summer, 1973) and Nancy Marrelli continued Véhicule Press from a greystone in the Plateau Mont-Royal arrondissement, not far from The Main and around the corner from where the poet Émile Nelligan once lived. Since 1973 Véhicule Press has published award-winning poetry, fiction, essays, translations, and social history. Simon Dardick and Nancy Marrelli are the publishers and general editors, Vicki Marcok is Office Manager and Maya Assouad is Marketing & Promotions Manager. Michael Harris was the founding editor of the Signal Editions poetry series in 1981. Carmine Starnino became Signal Editions editor in January 2001. Since 1981, over one hundred titles have been published in the series; a quarter of them by first-time authors. Esplanade Books, Véhicule's fiction imprint. In December 2013, after editing 20 books in the series, Andrew stepped down and was succeeded by Montreal novelist Dimitri Nasrallah. We would like to acknowledge and respect that that we are publishing from Tiohtià:ke, the Mohawk name for a historic place for gathering and trade for many First Nations. It is unceded traditional Indigenous territory, where the lands and people have a history and legacy that is long and deep, and on which there have now been non-Indigenous Settlers for more than 375 years. It has been home to many Indigenous people from across Turtle Island, as are the many traditional territories in which all Canadian publishers work and live. As publishers we know we cannot re-write our history but we can be part of a concerted effort to contribute to reconciliation between Indigenous Peoples and Settlers—we have a special role to play in that process.